The police department of Fort Worth, Texas has officially responded to a violent threat against BTS member Jimin. 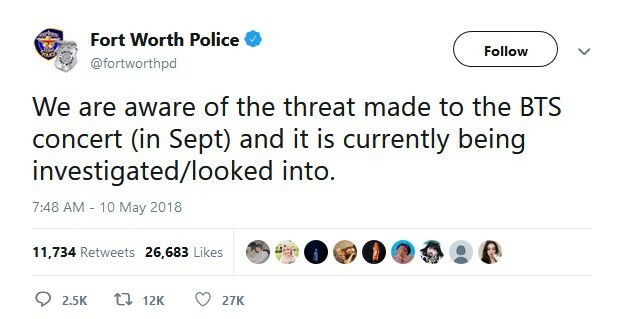 A random internet poster has threatened to shoot Jimin at a BTS concert scheduled for this September, and on May 10, Fort Worth Police tweeted, "We are aware of the threat made to the BTS concert (in Sept) and it is currently being investigated/looked into." 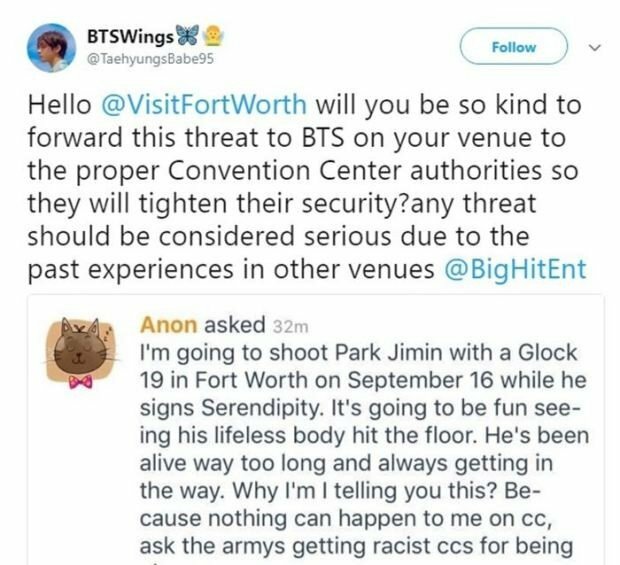 The threats came to light after a BTS fan noticed a post on the Q&A internet site Curious Cat that stated, "I'm going to shoot Park Ji Min with a Glock 19 in Fort Worth on September 16, while he sings 'Serendipity'. It's going to be fun seeing his lifeless body hit the floor." The poster added, "He's been alive way too long and always gets in the way. Why am I telling you this? Because nothing can happen to me on [Curious Cat], ask the ARMYs getting racist [Curious Catters] for being n******." BTS fans informed the Fort Worth city tourism Twitter whose manager thanked them for bringing it to their attention, stating, "
Thanks for bringing this to our attention! We will share with the venue and @fortworthpd. Always report any threats to local law enforcement as they provide security for major events like this. Thanks!" 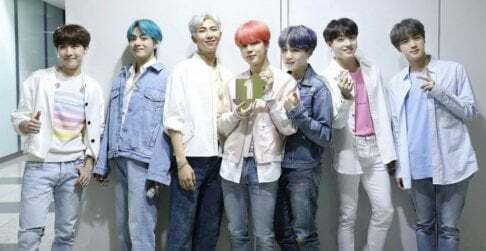 BTS are holding their 'Love Yourself' world tour concert at the Fort Worth Convention Center Arena in Fort Worth, Texas on September 15-16, and it's reported security measures, such as a bag size policy, will be in place at the event. However, there are no metal detectors at the venue. This is not the first time Jimin has received a death threat. Last year, a Twitter account user threatened to shoot Jimin from the crowd at BTS' 'Wings Tour' concert at the Anaheim Honda Center in California on April 1-2, 2017. 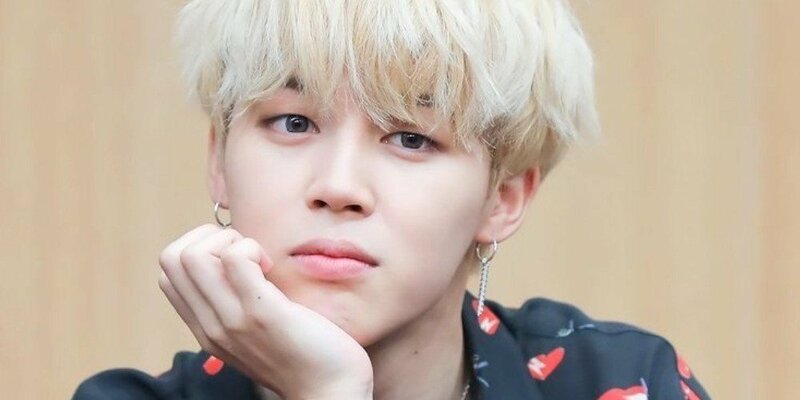 What are your thoughts on the death threats against Jimin?